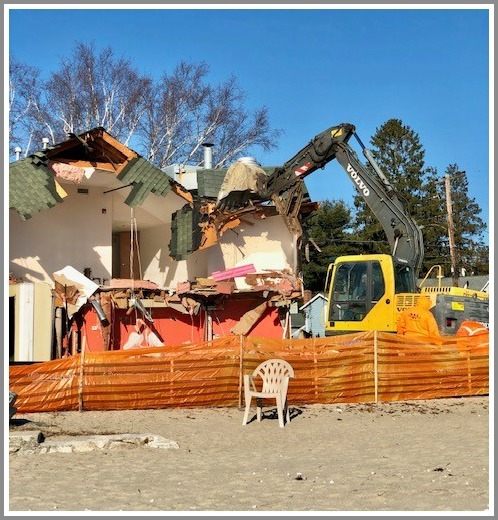 Last month — when “06880” reported that Peter Nisenson flood-proofed, refurbished and saved 201 Main Street, the “little red house” on the Saugatuck River that had been slated for demolition — readers rejoiced. Now Nisenson and his PEN Building Company are about to start work on another property. It’s a new structure — but it sits on one of the most visible corners in Westport. For decades, 233 Hillspoint Road has been the site of commercial ventures, in the heart of the Old Mill residential neighborhood. First a grocery store, the 2-story building later housed restaurants, including Cafe de la Plage and Positano’s. This morning, it became Westport’s latest teardown. Over the next year, Nisenson will build a new home there. He and the owner have spent a couple of years planning how best to utilize the awkward-shaped lot — while maintaining the neighborhood character, and views admired by all Westporters. The new house will be pushed back from the road. A dense buffer zone with native plants will provide privacy in back for the owners. But it’s on a public beach. 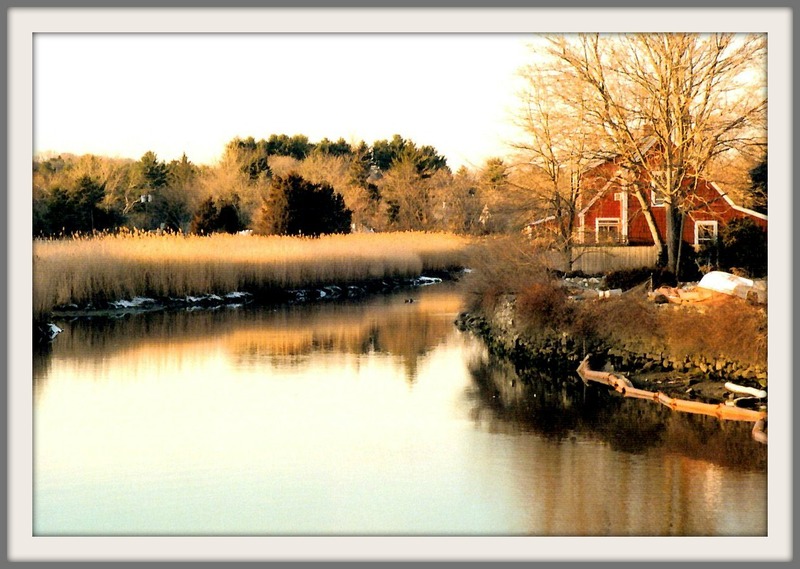 The property ends where the sand begins — so Old Mill will remain the same as it’s always been. The sidewalk in front will remain too. The former restaurant has been vacant for nearly 4 years. Neighbors — and everyone else who loves the beach area — hope that Nisenson’s new project will be as well received as his Little Red House. The Little Red House Lives! It’s a constant Westport discussion: empty Main Street storefronts, the perceived loss of community character, the fate of downtown. Recently, David Waldman — developer of Bedford Square on Church Lane, and the new retail/residential complex at the old Save the Children site on Wilton Road — cautioned in an “06880” post that pessimism can be self-fulfilling. He pointed out many positive occurrences downtown. Local preservationists/alert “06880” readers Wendy Crowther and Morley Boyd agree that good things are happening by the banks of the Saugatuck. They offer this story as proof. In December 2016, the “Little Red House” faced demolition. A new mixed retail and residential project was planned for 201 Main Street/15 Belden Place — the spot opposite Le Rouge by Aarti and Ron’s Barber Shop, occupied by an aging storefront and some riverfront residences. Immediately, “06880” readers expressed strong opinions about the loss of a familiar part of the downtown landscape. Perched on the edge of the Saugatuck River, the circa 1920 Colonial Revival style structure could never be mistaken for distinguished architecture. But that wasn’t the point. It was a picturesque little house which, despite flooding and development pressures, had endured. 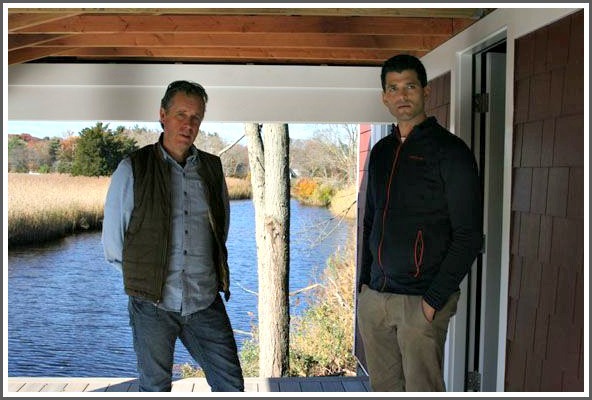 With the passage of time, the structure simply became a small part of what so many felt made Westport special. Westporter Peter Nisenson, of PEN Builders, saw the many comments on “06880.” As the property’s new owner, he quickly reconsidered his company’s plans to demolish the antique waterside structure. Nisenson realized that the house could actually become an attractive, valuable part of his larger redevelopment project. After obtaining a record-setting 15 variances (thank you, Zoning Board of Appeals! ), the Little Red House has been flood-proofed and refurbished. Today, it’s almost near completion. Now divided into 2 light-filled apartments – each with its own porch and astonishing 180 degree views of the Saugatuck River – the structure retains all its beautiful wooden beams. As a special nod to its place in the hearts of Westporters, the house’s original red paint has been color matched. So here’s our takeaway: Whether it’s a quirky iron bridge, a beloved local bar or simply a picturesque waterfront dwelling, residents need to speak up when our non-renewable resources become endangered. In this case, a savvy local developer responded to community input. He harnessed the peculiar power that authentic and familiar things seem to have over us. As a result, his project is enhanced. 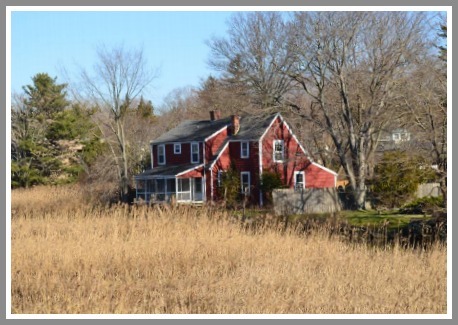 And the public has the satisfaction of knowing that the Little Red House will contribute to the aesthetic value of Westport’s riverfront for generations to come. How’s that for a positive downtown story?! 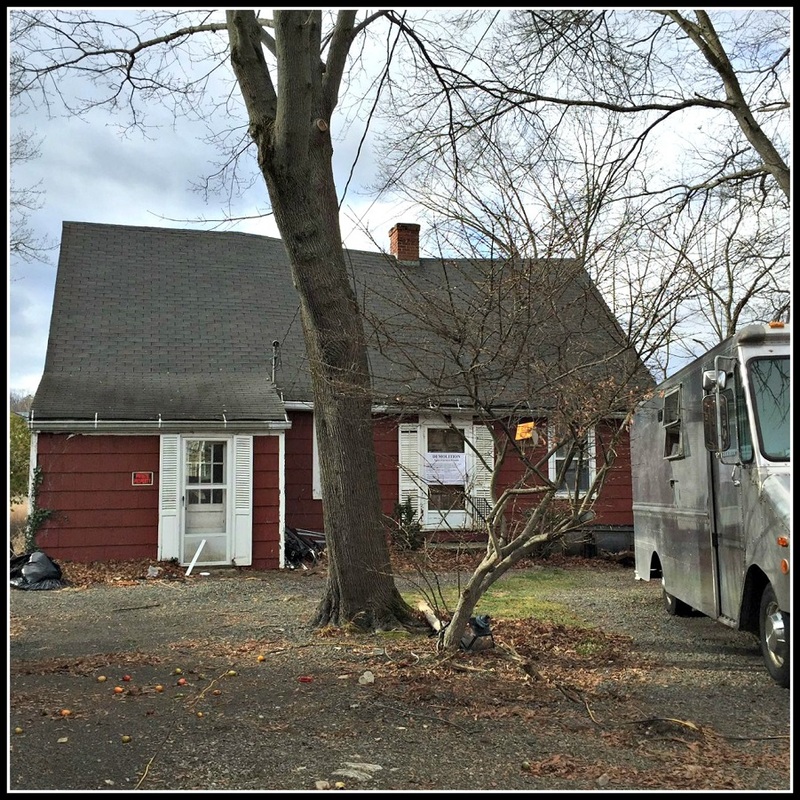 15 Belden Place: Little Red House Saved! In early December, “06880” broke the story about the proposed demolition of #7 and #15 Belden Place — the tiny, seldom-noticed piece of Main Street property just past Avery Place, opposite Veterans Green and Town Hall. Not many people cared about the 1st building. But boy, did they howl about the 2nd. #15 is listed in the Westport Historic District Commission inventory. It sits on the bank of the Saugatuck River (with quite a view!). Readers flooded the comments section of that story — and one with 3 other photos — decrying the proposal. Here’s a testament to the 06880 community and its passion for all things Westport. At a Historic District Commission hearing Tuesday night — just in time for Valentine’s Day — representatives for the new owner of the iconic red house by the Saugatuck River revealed plans to fully restore the beloved local landmark. On the same property, as part of its plan for retail and residential development, PEN intends to also save the large antique building that fronts Main Street which once housed Nappa Sales. 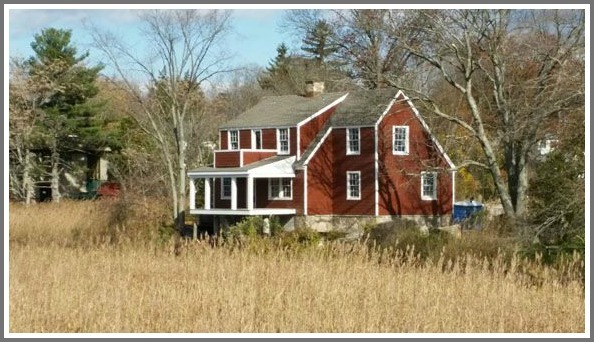 PEN officials noted the uniquely picturesque setting of 15 Belden Place, a building they refer to even on their official site plan as “The Red House.” Provided they can secure the needed zoning variances, the modest structure will remain in its original setting — though slightly raised to prevent further flood damage. PEN intends to then make repairs as needed to return the house to residential use — but with an eye to preserving its vintage appearance. While the windows will be replaced in kind, the location of the original openings will be kept as they were. Although the structure will also receive new systems, one thing about Westport’s most famous little house that Pen representatives will not change: the color. 15 Belden Place, as seen from the parking lot off Main Street.